More than 2,500 years ago, the Sakya clansman lived along the southern foothills of the Himalayan mountain in Northern India. Their king was Suddhodana Gautama, and his queen was called Maya. For twenty years, they had no children. 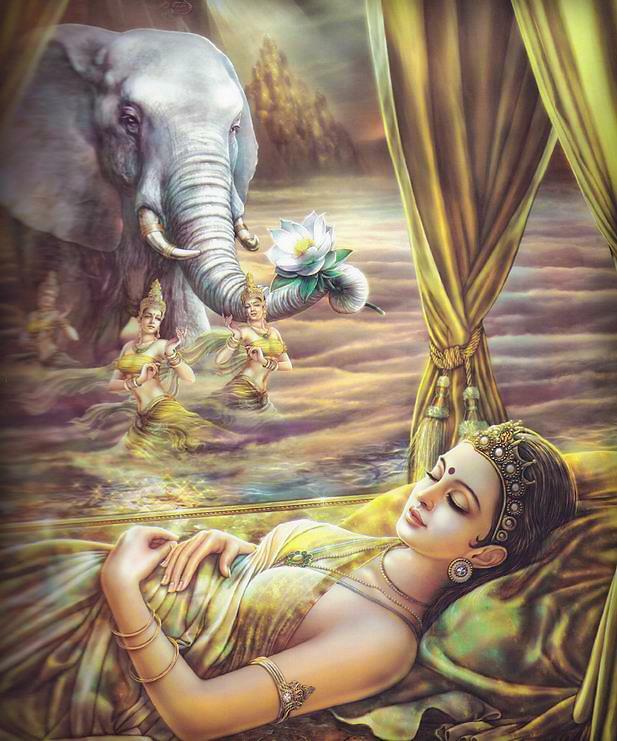 One night, Queen Maya had a strange dream, in which she saw a white elephant entering into her womb, and she became pregnant. According to their custom the Queen returned to her parent's home for the birth. On her way, while she took a rest in a beautiful garden, the prince was born, and all expressed their heart-felt delight with the glory of the Queen and her princely child. The king was in extreme joy, and named the child, Siddartha, which means "Every wish fulfilled." Joy was followed quickly by sorrow, for seven days after the birth of the child, Queen Maya suddenly died. Her younger sister, Mahaprajapati, became the child's foster mother and brought him up with loving care. A hermit, called Asita, who lived in the mountains not far away, noticed a radiance above the castle. Interpreting it as a good omen, he came down to the palace and was shown the child. He predicted: "This Prince, if he remains in the palace, when grown up will become a great king and rule the world, but if he forsakes the court life to embrace a religious life, he will become a Buddha, the Saviour of the world." At first the King was pleased to hear the prophecy, but later he started to worry about the possibility of his only son leaving the palace to become a religious recluse. At the age of seven, the Prince began his lessons in the civil and martial arts, but his thoughts more naturally tend to other things. One spring day, he went out of the castle, with his father and saw a farmer in worn-out clothes ploughing the field and whipping an ox, he came to understand the difficult life of living beings. He also saw a bird pecking at an earthworm and an eagle swooping down on the bird; he came to understand that living beings kill one another and only the strongest can survive. On another occasion, while in the woods, he rescued a swan wounded by men, he understood that all beings wish to live and all have the right to live. He felt that all beings should understand this truth and avoid killing. The Prince, who had lost his mother so soon after his birth. was deeply affected by the tragedy of these little creatures. The spiritual wound deepened day by day as he grew up. Like a scar on a young tree, the suffering of human life became more and more deeply engrained in his mind. In the palace, the Prince received an all round education. Being intelligent and eager to learn, the Prince became very good at studies and military skills. The king was increasingly worried as he recalled the hermit's prophecy and tried in every possible way to cheer the Prince and to turn his thoughts in other directions. King Suddhodana wished that the Prince would one day come to the throne and become a hard working and loving king. When the Prince turned nineteen, the King arranged his marriage to the Princess Yashodhara. For ten years the Prince lived in the luxury and pleasure of the palace, but always his thoughts returned to the problem of suffering as he tried very hard to understand the true meaning of human life. One day, while on an excursion beyond the walls of the palace, the Prince met with an old man, a sick man and a dead man, and saw into their sufferings. He then came to understand that life was filled with sufferings and that all beings are subject to birth, old age, sickness and death. On another occasion, he came across a religious recluse who looked calm and composed. The sight of the recluse suggested to him that a religious life might be a way to end sufferings. From then on, the Prince had a new outlook on life. He thought that one should not waste time and energy on sensual pleasures but should strive to work for the welfare of all beings instead. The spiritual struggle went on in the mind of the Prince until his only child, Rahula, was born when he was twenty-nine. This seemed to bring things to a climax, for he then decided to give up the luxurious palace life and departed from his wife and other loved ones, to look for the solution of his spiritual unrest in the homeless life of a religious recluse. One night, the Prince riding on a white horse, left the palace and set off in search of - a solution to sufferings. The Prince went from place to place and learnt from many well-known teachers in his search for the truth, however he failed to find the truth. He then began practising self-torture enduring all the pains that came with it. After six years of self-torture, his body became very weak and yet his mind still could not find peace. Now, he came to understand that going to extremes was not the correct way of life, as it could not solve the problem of suffering. He went bathing in the river and accepted a bowl of milk from a village girl. The five companions who had lived with the Prince during the six years of his ascetic practice were shocked that he should receive milk from the hands of a maiden, they thought him degraded and left him. After regaining some of his strength, the Prince started meditating under a Bodhi tree, it was an intense and incomparable struggle for him. While he was meditating, various temptations appeared, seducing him to give up his struggle for the Truth, but he remained unmoved. He then directed his incomparable power of concentration to attaining the Truth. At last, he understood the cause of sufferings and found a way to remove it. When the morning star appeared in the eastern sky, the struggle was over. The Prince's mind was as clear and bright as the breaking day, he had gained the supreme wisdom and found the path to Enlightenment. The Prince was thirty-five years of age. From this time on, the Prince was known by different names: people spoke of him as the Buddha, the Perfectly Enlightened One; some spoke of him as Sakyamuni, the honoured one of the Sakya clan; some called him the World-Honoured One. After attaining the Truth, the Buddha decided to spread His teachings using different methods to suit the different background of the listeners, so that they may be freed from sufferings. The Buddha first spoke His teachings to His five former companions. At first they shunned Him, but after they had talked to Him, they believed in Him and became his first disciples and came to be known as the First Five Monks. The Buddha went from place to place to teach, gathering round Him all types of followers. People responded to Him as the thirsty seek water and the hungry food. Within a short time, the Buddha had thousands and thousands of followers. Eventually, even His father, His step-mother, His former wife and all the members of the Sakya clan became His faithful disciples. For forty-five years, the Buddha went about the country preaching and persuading men and women to follow His way of life. When He was eighty, during a trip, He became very ill and predicted that after three months, He would pass away. In spite of great pain, He proceeded to His destination and continued teaching until His last moment. Thus the Buddha entered into perfect tranquillity after He had completed His work as the world's greatest teacher. The remains of the Buddha were cremated. His relics was then equally divided into eight parts and distributed to different parts of the land to be enshrined in great towers commemorating the Buddha. Although the Buddha had already left us, His teaching still remains after many generations for the benefits of countless human beings. Today Buddhism is found in every country in the world with a Buddhist population of over 500 million people.